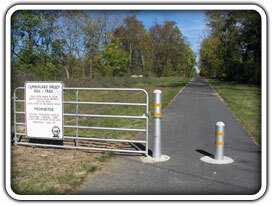 The Cumberland Valley Rail Trail runs through the entire length of North Newton Township (see the North Newton Township Map) on its way from Shippensburg to Newville. Oakville serves as the halfway point on the trail. The township park is just a short walk from the trail by way of Oakville Road. The park can provide a refreshing break from your hiking or biking. Picnic facilities are available at the park as well as along the trail in Oakville. The park’s restroom is normally available during daylight hours for Rail Trail users. ExplorePAtrails.com is a website created by the PA Department of Conservation and Natural Resources featuring an interactive map, driving directions, and a forum for updating trail information. Explore this website to plan your next adventure.